Yesterday on Instagram I posted a photo of my BEAUTIFUL Illustrated Harry Potter and the Sorcerers Stone book next to these scrumptious Pumpkin Pasties I made and got several requests to post my recipe so here it is! And don't think that these pumpkin delights are just for Harry Potter fan, oh no. These mini pies are for any PUMPKIN and/or DESSERT FANS. 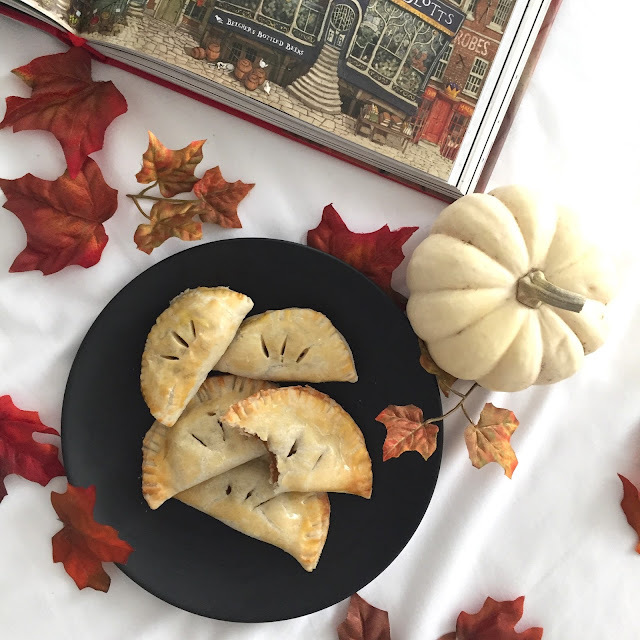 These pasties are a glorified mini pumpkin pie that are the perfect size to satisfy your sweet tooth. Without further adieu, here's the recipe, enjoy! Filling makes about 4 dozen miniature pasties. DIRECTIONS: Add all pie filling ingredients into bowl and mix well until smooth. Bake the pie filling only (no crust) in a large casserole dish in hot oven (425 degrees) for 15 minutes. Keep oven door closed and reduce temp. to 350 degrees and continue baking for 45-50 minutes or until knife inserted in center of dish comes out clean. 1. Cool filling on wire rack. 3. Add a spoonful of cool pumpkin mixture towards one side of the center of the cut out pie crust circles. Fold circles over the crust into a half-circle and firmly crimp the edges closed with fork. 4. Brush pasties with egg white wash (with a dash of salt) and slice three small slits in the top for venting. Place pasties on a greased cookie sheet, and bake at 400 degrees until crust is a light golden-brown, around 9-12 minutes. Serve warm or at room temperature. As another option, you can brush butter on top instead of egg white wash and sprinkle cinnamon sugar for an even sweater treat.